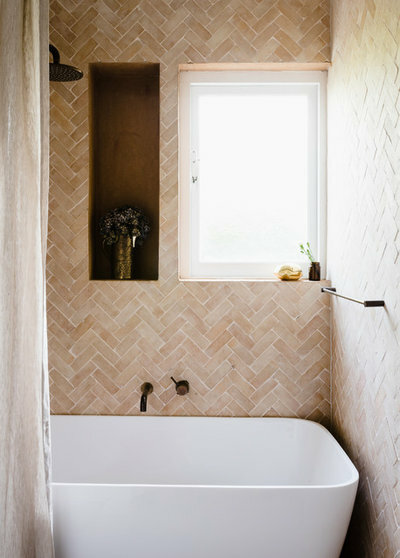 When interior architect, founder and director of GABBE and Tiles of Ezra designs for her clients, she is careful to reflect their individual styles and needs, not her own. 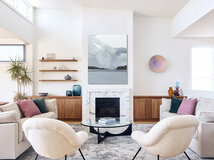 But when it came to renovating the home she owns with her husband, construction manager Richie Morris, the couple had carte blanche to indulge their aesthetic preferences. 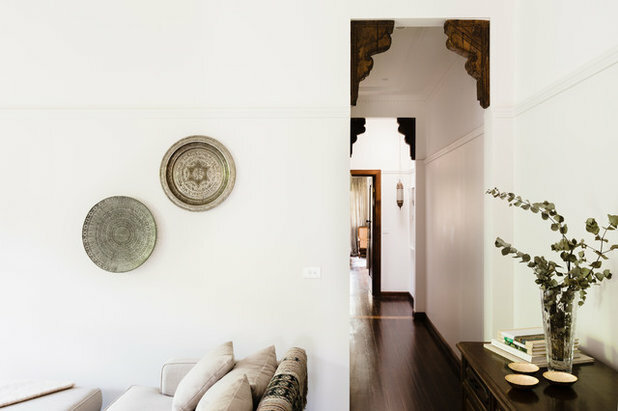 The result is a rich, tactile interior sanctuary where clean, modern lines are laced with sumptuous Moroccan, Indian and Jewish cultural references. The home had not been touched since it was built in 1923, so asbestos was removed and new plumbing and electricals were installed throughout. 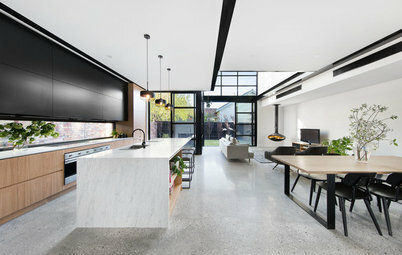 Ezra brought the level of the floor up, closed doorways and opened walls to restructure the spatial plan of the house. Two original bedrooms were transformed into a master bedroom, walk-through robe and ensuite. 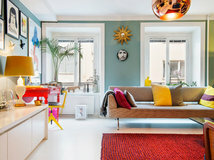 The original living room became a second bedroom for the couple’s one-year-old son, Jesse. “Basically, we had to bring the house from 1923 to 2016,” says Ezra. Many original features were restored to a new splendour, and Ezra re-sanded and re-stained the existing floorboards and ceiling joists. 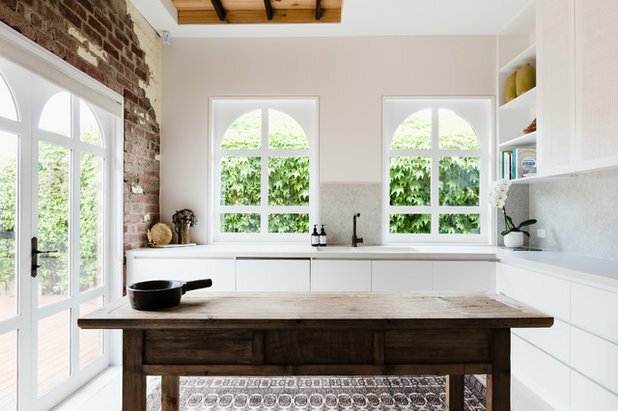 “We kept all the beautiful mouldings on the ceiling and all the existing doors, door handles and skirtings; we carefully removed them, stored them in the garage then reinstated them,” she says. “The kitchen was awful so we literally bashed down the entire thing and got rid of it all.” In its place, she designed the fresh new kitchen you see here, with its custom-made arched door and window frames, which bridge the stylistic gulf between today and a century ago when the house was built. 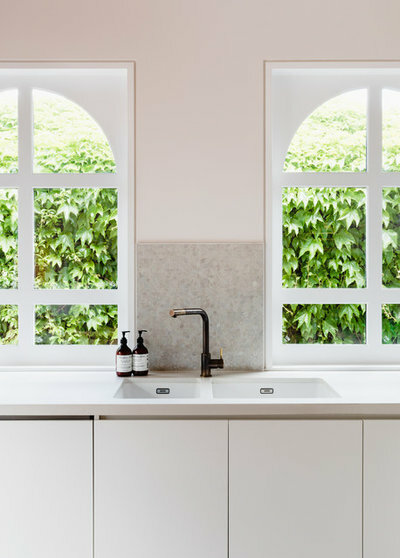 At first glance, you might register a white kitchen, but Ezra admits that the all-white style is not one she is personally drawn to. 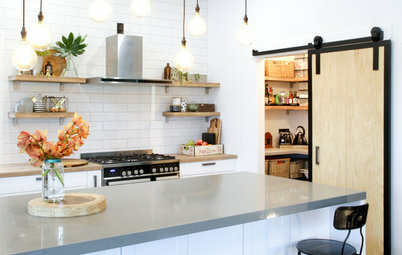 Instead, the couple’s kitchen is a study in texture and tone. This tonal variance brings warmth to the space and prevents it from appearing stark or lacking that depth of dimension. 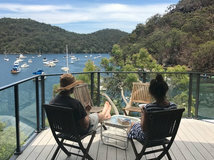 After the large outlay of purchasing the property, Ezra and Morris were eager to keep renovation costs down, so they took advantage of their industry contacts wherever possible. 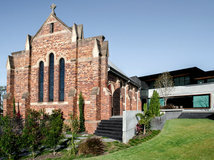 Their renovation was also a record-breaking tour de force in terms of time. The couple finished in just under four months, and could have cut that period of time down to three, had many businesses not been closed over December and January. Ezra is the first to admit that such extensive renovations would usually take longer for people who did not work in the design, architecture and building industries. 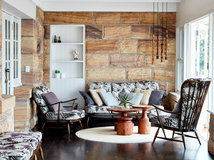 Each room pays homage to Ezra’s love of texture in thoughtful and unpredictable ways. In today’s homes, ceilings are often plastered, painted white and left unadorned, but not here. Instead, Ezra chose to expose the joists from the original ceiling, which were sanded back and re-stained. 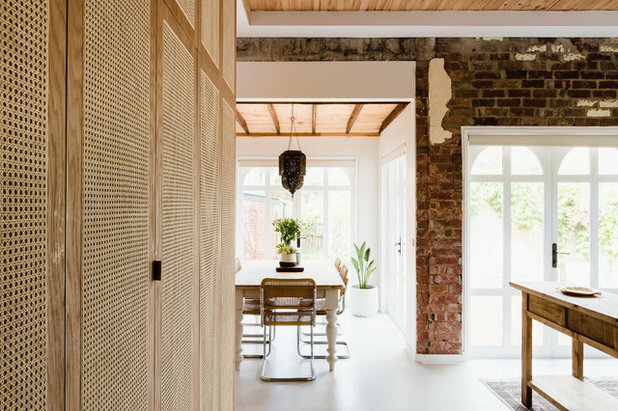 She then added a textural cladding above the joists to indulge her affection for tactile designs. “If we didn’t have that it wouldn’t feel half as warm as it does,” she says. 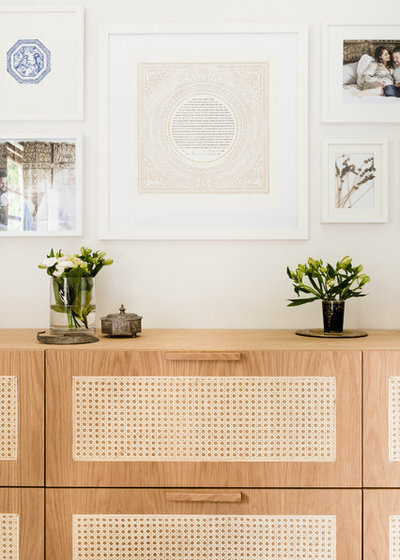 Rather than purchasing a suite of new furniture, the couple feathered their nest with pieces they collected over the years, bowerbird style. 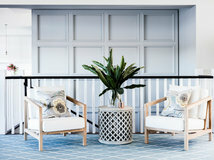 “We bought plates, chairs, dining chairs, tables and consoles off Gumtree, and we bought beautiful wicker armchairs at auction houses,” Ezra says of her eclectic approach. 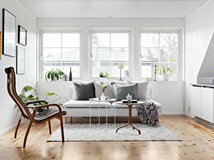 The interior architect finds it difficult to define her own style – partly because she loves many different aesthetics and partly because she is more practised at appealing to her clients’ styles at GABBE. But when pushed, Ezra describes her own style as a meeting of modern with an eclectic mix of different cultures. 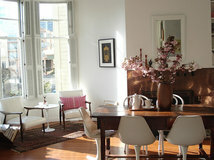 Born in Australia, Ezra has lived in Spain and has a truly intercontinental background, which shines through in her home. Her father was born in India and is of Persian descent, and her mother was born in Australia and has Eastern European heritage. 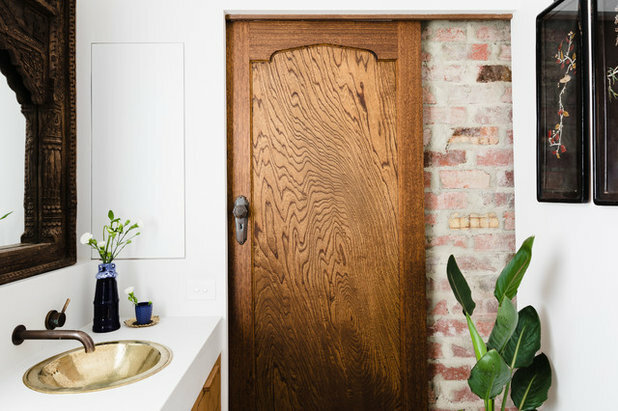 When designing for her clients, Ezra prides herself in confidently making quick decisions, partly because her emotions are removed from the process. But interestingly, she continually sought the opinions of others throughout the process of designing for herself. 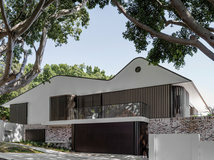 But when it came down to it, every design decision in Ezra and Morris’ home was made by its resident interior architect and the lady of the house – except one. “The fireplace has this beautiful, angled shape and I wanted to straighten it up like a really long rectangle,” she explains. “But my dad and my husband were saying ‘Leave it as it is, it charms the house and that’s what’s giving you a point of difference’. So I left it and I’m so happy that I did”. 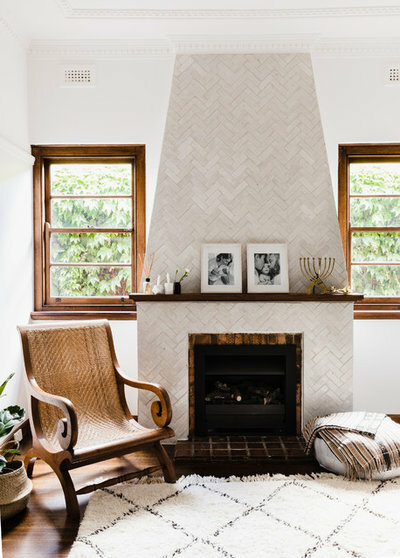 The fireplace in question is topped with a mantlepiece Ezra procured in Vietnam, and is accented with tiles from the designer’s own collection, which she laid in a herringbone pattern. 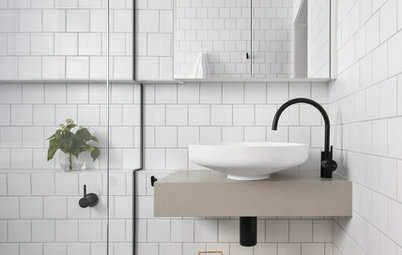 Ezra founded Tiles of Ezra because she struggled to find the richly evocative tile collections in Australia that she had seen in other countries. Ever passionate about her collection, which is handcrafted in Morocco, she stands is the gatekeeper of quality at every step in the production process, to ensure not a single corner is cut. 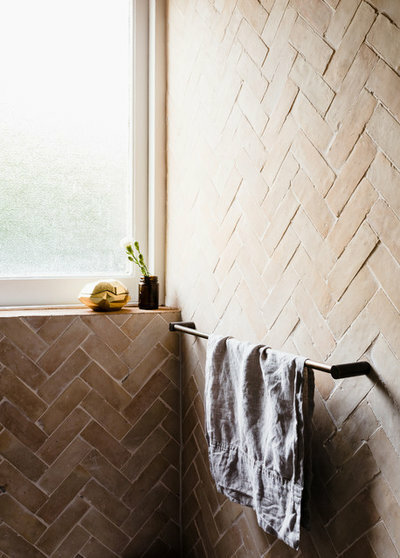 “You can look at zellige tiles and you might not tell the difference between two whites, but I can see if the clay has not been beaten to get the bubbles out, which affects the quality and whether it will break or not,” says Ezra. 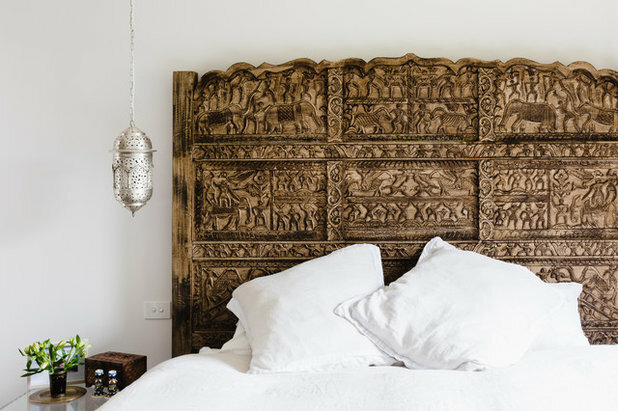 It takes careful curation and an expert eye to balance Indian, Moroccan and Jewish decorative accents within an original Art Deco shell. But Ezra achieved exactly that by using a neutral, unifying colour palette. “I think they marry so well together because although I’ve chosen elements from different cultures and exotic backgrounds and styles, ultimately they all line up beautifully in terms of their colour and their tone,” she says. 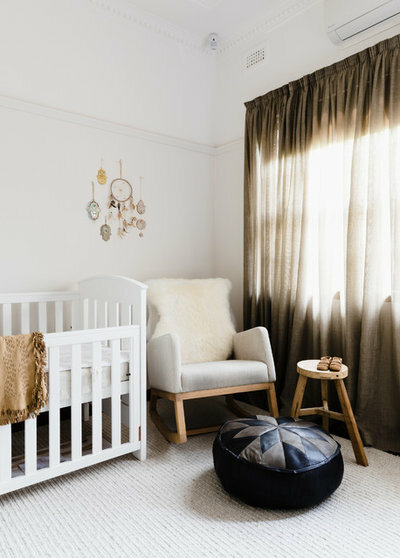 Ezra was pregnant while she and Morris underwent their renovations, so a child-friendly home was important – but not at the expense of beauty or charm. 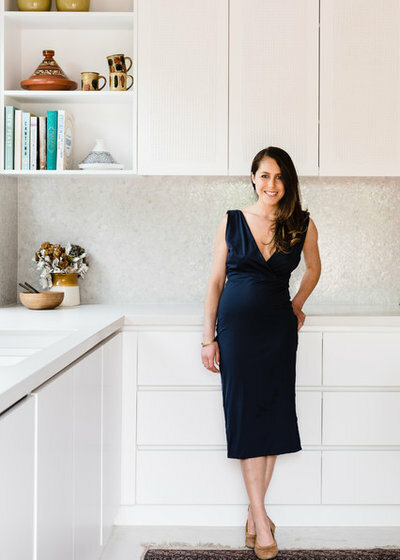 As another feather in her many-plumed cap, Ezra also authored the book A Healthy Home, A Healthy You, which explores how our surroundings affect our emotional wellbeing. 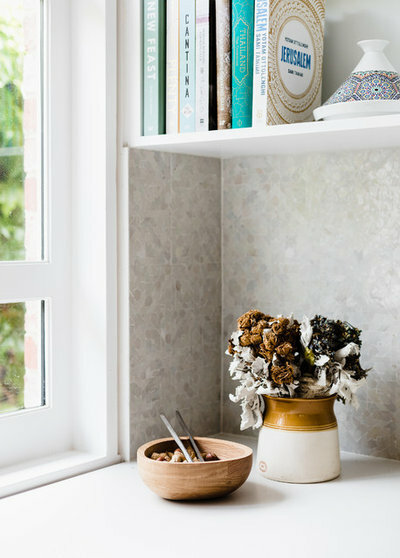 This ethos is what informs Ezra’s attention to texture, which you see throughout her home. 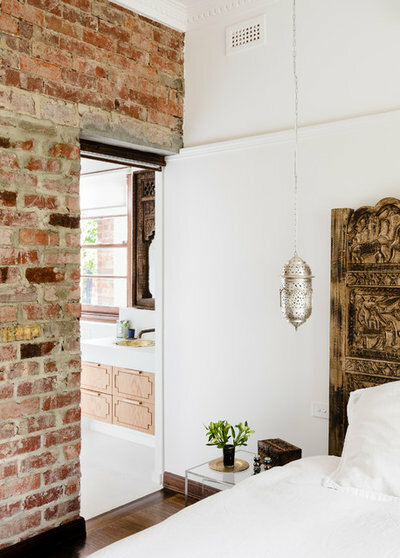 Amble through this space and you will find richly tactile surfaces in every room that tempt you to run your fingertips over them, including the couple’s bedhead, which was custom-made in India. 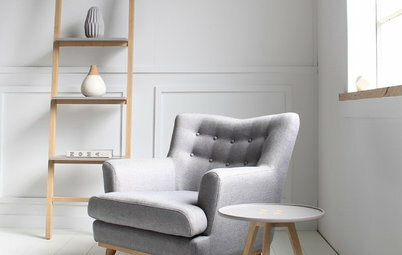 Warm, earthy creams, honeyed hues, beiges, greys and whites are juxtaposed throughout, with timber in a fresh, light tone or a darker, more romantic stain. Add to this the natural shades and tonal variance you see in Ezra’s tiles, and the finished result is a home rich in texture. But even though you would never describe Ezra’s home as neutral, its base colour palette is. Ezra’s design philosophy is that of a true interior architect. Not content with making a statement exclusively through furniture or furnishings, she wanted the bones, the muscles and the very sinews of her home to stand as design statements in their own right. Ezra is besotted with the finished result. “I love walking into my home every single time,” she smiles. What’s your favourite feature of this home? Tell us in the comments below, save your favourite images and if you enjoyed this story remember to like it, share it and bookmark it. 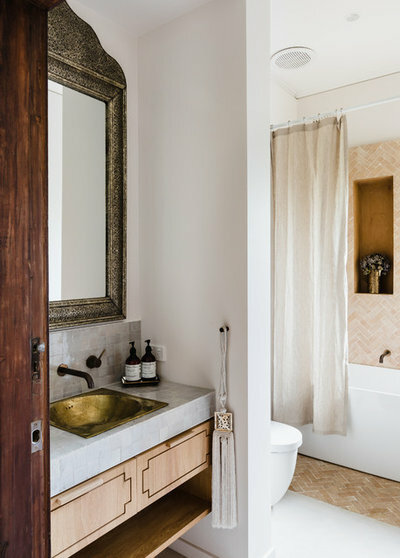 I adore the brass bathroom sinks! Unique and timeless. 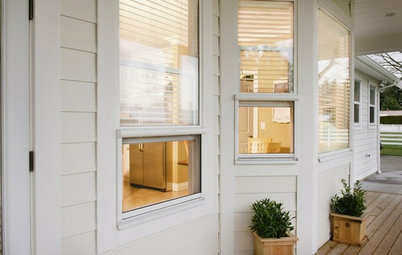 Truly a passionately designed home and I do like the personal touches included. Ezra has such a gift to be able combine simple with her Jewish, Arab and whimsical influences. So many ideas with her palette. I will save this posting. Thank you so much Much! !